After nearly four decades of growth, The Container Store's DC had reached its limits. That's when the retailer installed a high-performance automated fulfillment system that has reshaped its entire operation. Most distributors eventually realize that only so much can be accomplished with manual operations. Sooner or later, volume reaches a point where companies can no longer handle seasonal peaks by simply throwing more labor at the problem. The Container Store reached that place about a year and a half ago. "We've been in continual growth since we started 38 years ago," says Amy Carovillano, vice president of logistics and distribution. "We just tipped the point where the return on investment was really there for automation." To understand what brought the company to that juncture, it helps to know a little about The Container Store's business. Since its founding in 1978, the company has grown into the nation's largest specialty retailer of home organization and storage systems, selling containers of all shapes and sizes as well as organizational solutions like its custom closet system. The retailer, whose business peaks around the holidays and during back-to-school season, now operates 90 stores as well as a fast-growing direct-to-consumer business. Not surprisingly, all that growth has put something of a strain on the company's sole DC—an 875,000-square-foot facility in Coppell, Texas. In an attempt to rev up operations a few years back, the company had invested in Lucas Systems' Jennifer voice-directed picking solution as well as a new warehouse management system (WMS) from Manhattan Associates, both of which it continues to use today. Although these moves provided an immediate bump in productivity, it soon became clear that even state-of the-art digital tools couldn't "fix" the operation's core problem: the amount of travel time required in what was essentially a manual operation, where orders were still filled from static racks and shelving. Not surprisingly, the inefficiencies eventually began taking a toll on performance. "We had a real problem with getting orders out the door on time, especially when we had volume spikes," says Christy Parra, senior logistics director. After evaluating its options, the retailer decided its best hope lay in automation. For help with the project, The Container Store turned to Dematic, a designer and supplier of warehouse systems. As for the type of system it was looking for, the retailer told its supplier it wanted a high-performance order fulfillment system that would allow it to fill orders for both store and direct-to-consumer channels from a common inventory—an approach that would simplify processing while increasing speed and efficiency. Totes are color-coded by order size and final destination. Red and yellow totes hold direct-to-consumer orders; the yellow totes contain smaller orders. Blue totes hold store orders. The solution Dematic designed for its client includes conveyors, a sliding shoe sorter, and two large picking modules: a three-level module that holds items picked in case quantities and a two-level module that's used for less-than-case picking. That last improvement has been something of a game-changer for the retailer, according to Parra. "We went from a static pallet environment to pick modules," she says. "We can now pick two to three times faster out of the pick modules than we could from the floor locations." Of course, as with any project of this magnitude, the changeover required a bit of patience, especially given that implementation took place while operations were running in high gear. Parra characterizes the transition this way: "It was like remodeling a home while having house guests and serving Thanksgiving dinner." 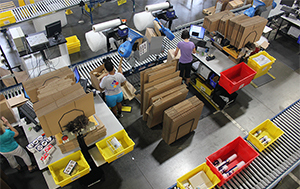 Today, fulfillment operations at the Coppell distribution facility unfold with choreographed precision, thanks to an array of smart tools. These include the Jennifer voice system, which directs order picking throughout the building, including the two new pick modules. They also include 120 multimodal terminals from Motorola (now Zebra), which are used by pickers in two shifts to "drive" the voice system and for scanning bar codes. Then there's the Manhattan WMS, which determines what products are needed for orders and where products are stored within the facility. Typically, the software assigns larger items and slower-moving products to conventional racks, while sending faster-movers (as long as they're conveyable and fit in the storage slots) to the pick modules, which provide for swifter processing. Product selection actually begins in the conventional racking, where slower-moving, smaller-cube conveyable items are picked from racks and shelves into totes on rolling carts. Each tote represents an individual order. The totes themselves come in two sizes that are color-coded by order size and final destination. Smaller yellow totes hold direct-to-consumer orders and can fit eight to a cart. The larger totes, which fit four to a cart, include blue totes, which hold store orders and are lined with a plastic bag to make loading out easier later, and red totes, which are earmarked for direct-to-consumer orders that include larger items. The colors do not vary according to picking method, as all totes are filled from the same inventory and will eventually travel the same path through the automated system. The colors do, however, matter when the totes move on to packing or truck loading for stores. Pickers gather needed items from the racks according to directions from the Jennifer voice system. 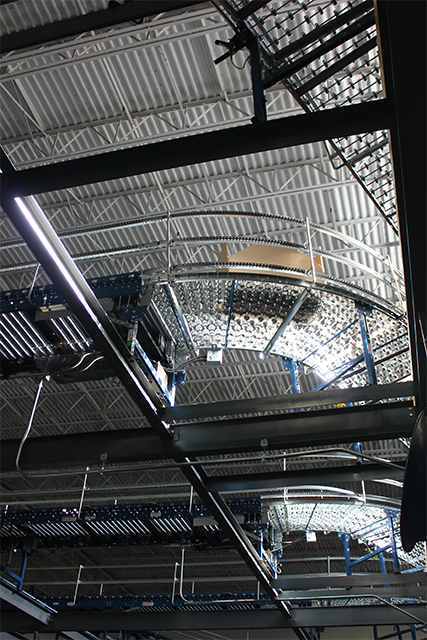 When picking is complete, the associate wheels the cart to the closest tote induction point on the conveyor system. If additional picks are needed, the totes then move by conveyor to the two-level less-than-full-case pick module. Otherwise, they head to packing. On the bottom level of the pick module, items are held on one side of the aisle in case flow racks and on the other side in shelving. 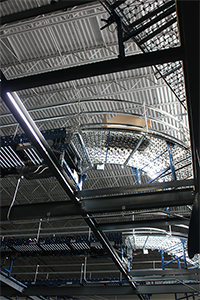 On the second level, products are stored on shelves on one side and in pallet flow racks on the other. The pallets hold faster-moving shoebox-sized items. Conveyors run through the middle of the module to transport products and move them between levels, which is done via spiral conveyors. To optimize the picking process, the two-level module uses a pick-and-pass approach in which order totes are diverted only to zones containing needed items. The two-level module is divided into 16 pick zones, eight per level. As with the cart picking area, orders for both the retail and e-commerce channels are filled from the same shared inventory, and color-coded containers are used for gathering items. These containers include totes that originated in the cart pick area as well as totes that begin their journey in the pick module. They may even include shipping cartons. To save time in packing downstream, the company picks some of its orders into the two most popular-sized shipping cartons. To optimize the picking process, the two-level module uses a pick-and-pass approach in which order totes are diverted only to zones containing needed items. As the containers ride along on the module's conveyor, their labels are automatically scanned. When a container arrives at the first pick zone with a needed item, diverters kick it off onto nonpowered side rollers. An associate assigned to that zone then gathers the containers—up to eight at a time—and assembles them into a "train" that he or she pushes on the rollers past the storage racks holding source products. To begin picking, the associate scans each container's label to let the WMS know the order of the containers in the train. The Jennifer voice system responds with specifics on the location of the first item needed. The associate moves the train to that location and reads off a check digit on the rack for verification. The Jennifer system then requests the required pick quantity. After the associate has selected the needed items and confirmed the quantity, the voice system directs him or her to place specific quantities of that item into the appropriate containers, according to their identification numbers. The associate then reads off a unique check digit located on the container ID label to assure the item or items have been placed in the correct container. The voice system then provides the next location number, prompting the associate to move the train as needed and repeat the picking process. Once all of the items for a given container have been picked from that zone, the associate is instructed to push the container off onto the conveyor and complete picking with the remaining containers. Cartons and totes on the conveyors that require further picks are then diverted to additional zones, where the process is repeated until all orders are filled. Blue totes are conveyed to the store shipping sorter, where the items are loaded for shipment to retail stores, while the red and yellow totes and the cartons are conveyed to pack stations. 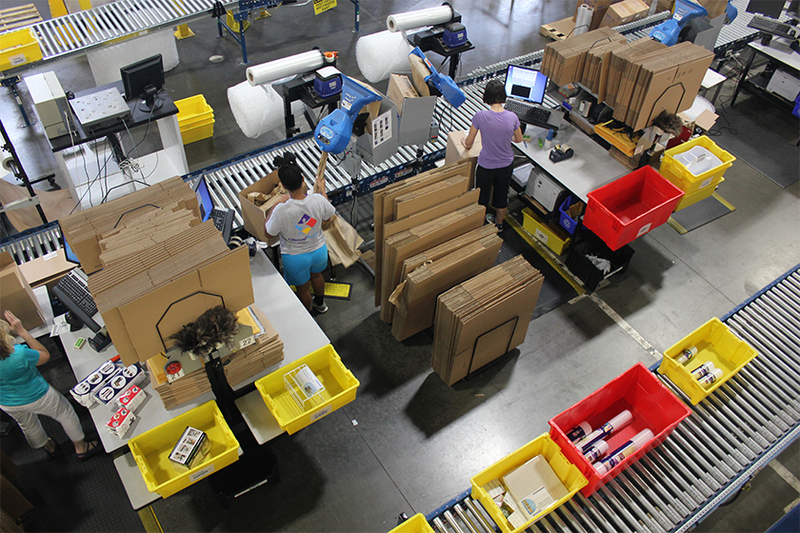 There are 26 stations for small-order packing, including Internet-based and store shipping orders. Employees scan arriving totes and cartons, which triggers the printers to generate packing lists. They then remove the items from the totes and verify them against the pack lists before packing them into shipping cartons. The items that were already picked into cartons are also verified against the packing lists. Associate then apply bubble air wrapping from Sealed Air Corp. or kraft paper from Ranpak to protect any fragile products. After that, the cartons are automatically sealed, dimensioned, weighed, labeled, and then conveyed into parcel trucks. Meanwhile, case-level picking is performed in the three-level full-case pick module. Cases here are held in 320 pallet flow rack positions, each of which is double deep. After gathering a stack of printed pick labels, associates begin the selection process under the direction of the Jennifer voice system. The order picker first scans the task ID, which is created to optimize batch picking and devise the optimal travel path. The system then directs the picker to the appropriate location, asking for a check digit for validation. Once the location is confirmed, the associate selects the needed cases, labeling them as he/she places them onto a conveyor belt that transports them to the shipping sorter. Pack stations contain a selection of cartons and protective packing materials. Conveyable cases that are not selected in the module, such as cases of slower-moving items, are picked from conventional racking to walkie-rider pallet trucks. Labels for these cases are staged at the beginning of work areas. 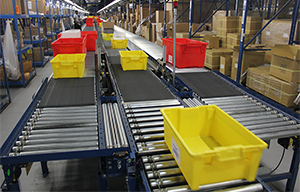 An associate gathers the labels and follows the same selection process used in the pick module, except that the cases are placed on the walkie-rider pallet. Once complete, the pallet is driven to the closest induction point for manual placement on the conveyor. 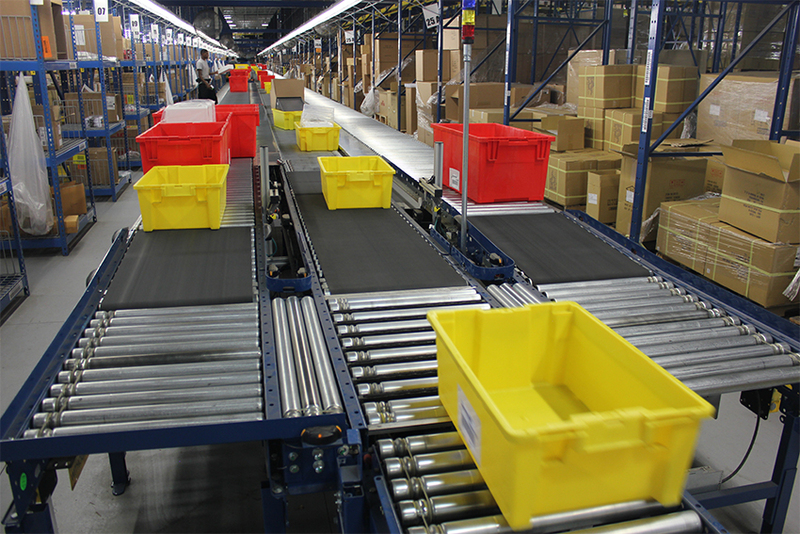 The conveyor routes cartons destined for direct-to-consumer orders to pack stations, while those heading to stores flow to the shipping sorter. Larger, fragile non-conveyable each-pick items, such as trunks, trash cans, and under-bed storage boxes, are also picked to walkie-rider pallets or carts, depending on size. These are taken to 12 different pack stations that contain a selection of larger cartons and protective packing materials. At the pack stations, associates package the items in the appropriate shipping cartons, which are then sealed and conveyed to labelers. The packing area also contains an additional nine stations that are used for packing even larger non-conveyable products, such as shelving and closet units. Once packed, items from these bulky-item stations are loaded onto parcel carrier trailers. The blue totes and more than 20,000 daily store-bound cartons merge together into a sliding shoe sorter that diverts them to one of 10 shipping lanes. When it's time for loading, associates first floor-load the cartons onto trailers. They then remove the plastic bags that hold the smaller less-than-case products in the blue totes and place them on top of the stacked cartons. Each outgoing truck is dispatched to a single store, with each store location receiving a shipment once a week on average. By all accounts, the new automated systems in Coppell have produced impressive results. Carovillano reports that the company has more than doubled the percentage of orders it can process within 48 hours—to 71 percent from 32 percent. In addition to boosting DC throughput, the new equipment has reduced labor requirements by a full 14.5 percent. On top of that, it has solved the problem of getting orders out on time during peak periods, according to Parra. "With automation, we are now able to handle those spikes," she says. The new systems have also made it easier for employees to handle goods once they arrive at the stores. "A huge benefit of the automation is that we now have a label on every carton that indicates the department and aisle where that product should go," says Carovillano. "We are hitting all of the benefits that we expected. It's been really great." David Maloney has been a journalist for more than 35 years and is currently the editorial director for DC Velocity and Supply Chain Quarterly magazines. In this role, he is responsible for the editorial content of both brands of Agile Business Media. Dave joined DC Velocity in April of 2004. Prior to that, he was a senior editor for Modern Materials Handling magazine. Dave also has extensive experience as a broadcast journalist. Before writing for supply chain publications, he was a journalist, television producer and director in Pittsburgh. Dave combines a background of reporting on logistics with his video production experience to bring new opportunities to DC Velocity readers, including web videos highlighting top distribution and logistics facilities, webcasts and other cross-media projects. He continues to live and work in the Pittsburgh area. Feedback: What did you think of this article? We'd like to hear from you. DC VELOCITY is committed to accuracy and clarity in the delivery of important and useful logistics and supply chain news and information. If you find anything in DC VELOCITY you feel is inaccurate or warrants further explanation, please ?Subject=Feedback - : Thinking outside the boxes">contact Chief Editor David Maloney. All comments are eligible for publication in the letters section of DC VELOCITY magazine. Please include you name and the name of the company or organization your work for.